Admittedly this looks a bit messy. But, by the time I thought to take a picture, there was not much left. It's ahi (tuna) steamed with onion in banana leaves and topped with my take on a cacao nibs curry. What starts as stiff joints, pain and numbness in the hands finally takes me to Honolulu for an exam and cortisone shot. On the good side, our trip to the big city included dinner at Indigo, where the son of a friend works. A delightful and inspiring restaurant with various indoor and courtyard eating areas and three bars. Decorated with an eclectic whimsey and strong South East Asian influences, Indigo has almost the feeling of a seraglio (or what I'd imagine anyway). From the unobtrusive street front, you would never guess all this was going on inside. The food, billed as Eurasian cuisine, was terrific as well. You might have guessed by now that I had fish with a cocoa curry, and yes, also served in a banana leaf. Chef Glenn Chu's creation was delicious, but much more subtle. I decided to try for a distinctly spicy, with overt cacao taste in my version last night. And, that turned out to be a nice contrast to the rather bland ahi. I feel so blessed, we also had brunch at Sam Choy's and got to try their pastry chef's signature macarons - haupia and papaya. Here I'd just been reading a few food bloggers' takes on macarons, David Lebovitz for one, and had decided I'd not be making anything that complicated. Though, as a later amendment, I found this recipe, which looks yummy and not too very difficult. Wow! Not to mention another high point - next morning at my all time favorite place for breakfast - it's called Orchids, at the Halekulani Hotel. God is kind. There is pain, yes, but some awesome stuff as well. I won't even discuss the shopping. Process, or pound the spices in a mortar, fine as you'd like - I left mine a bit crunchy, but next time will probably try a smoother blend. Heat the butter in a small saucepan til melted, then add the ground spices mixture, coriander and cinnamon. Heat, stirring until fragrant, then add 1/4 cup white wine, reduce for about 15 minutes while your fish (or chicken breasts) cook, add the coconut cream and continue simmering at low heat. Add the fish and stir to coat. Note: This recipe has been modified (improved) here to include the coconut cream and white wine, from the photo shown on the original post. The leaves of the 'Ulu or Breadfruit tree have inspired Hawaiian quiltmakers for nearly 200 years. 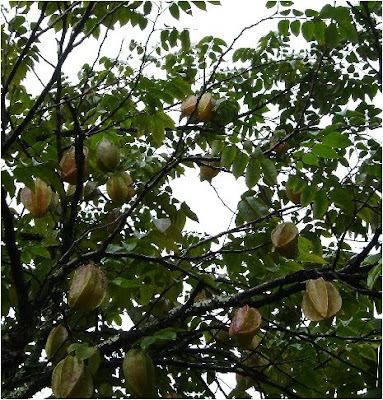 It is a lovely ornamental tree and the fruit is very useful as well, having long been a staple food in Polynesia. Since we planted quite a variety of fruit trees on our property - some of them over 25 years ago - I have felt a responsibility to use them in a productive way. Not just as compost falling to the ground beneath the trees. So, this has required a bit of research and experimentation, trial and error sometimes, and, yes fruit still gets wasted, rotting on the ground, driving me crazy. Guilt, guilt, guilt. But, hey, you do what you can. This breadfruit pudding, called Papaiee, is a wonderful use of the fruit. Kind of a cross between mashed potatoes and a sweet potato casserole in texture, though with the flavor of coconut mixed in. Breadfruit boiled or baked when green is more like boiled potatoes, firmer and also very good. When dead ripe, brown and crusty on the outside, you can make this cassarole. Next time I want to try it with milk or cream, butter and more savory type seasonings for a different take. If you bring in a green breadfruit, let it sit on your counter a few days until it is brown and crusty outside. Cut open and scrape out the soft flesh into a bowl. Mix in the remaining ingredients and stir together well. Pour into a buttered casserole dish and bake at 350 F for one hour. I served mine with oriental style, broiled ahi and a small salad last night. This recipe was adapted from Euell Gibbons' Beachcomber's Handbook, which I've had around for years. A very useful source for those living in the tropics. Now I want to research breadfruit in Indian cooking, if such a thing exists. If it doesn't, maybe it should. I may innovate something. Mushrooms are amazing. Actually, their Creator is the truly awesome and amazing One who designed our ecosystem, incorporating such a diversity of insect and fungal life, with everything in balance to protect and preserve life on planet earth. Scientists are today only scratching the surface of understanding how it all works. Insect kinds have been estimated at between 4 to 6 million species and fungi somewhere between 1 and 2 million (many of which are actually DNA variations of fewer kinds). Sometimes I take pictures of mushrooms in our gardens, and attempt to find them in my identification guide, Mushrooms of Hawaii. At present, we're working on a small shitake cultivation. I've also been dipping into a fascinating book, with the mythical title, Mycelium Running, How Mushrooms Can Help Save the World, by Paul Stamets. He reports that various types of fungi, acting as filters, are able to remediate toxins in the soil and environment, to accumulate them for removal, or to indicate where toxic metals exist. Sort of biological bottom feeders of the earth. They can and are being used intentionally to convert waste sites. This one was growing underneath the tangerine tree at our office - a large, strangely sponge-like fungi. Bob took a few photos. 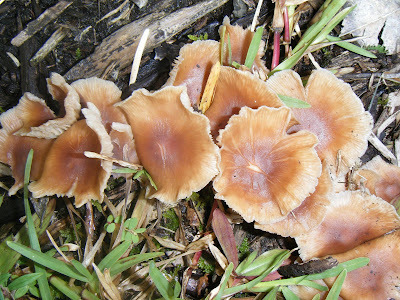 At home, and based on his emailed picture, I was looking for it in the mushroom book, trying to identify the species. I phoned and asked my granddaughter to go out to take some measurements (she's at the office today). Kealani just called back to inform me that it is the fruit-picker sponge. Yes folks, it must have fallen out whilst someone (Bob) was picking tangerines. Just goes to show you - the instructions to examine also gills, stem, & etc. as well as the cap, have a point. More than face value is involved. Is there a parable in this? Surfeit? Yes, the definition being, too great an amount or supply; excess. So, what do I do with my God-given overabundance of starfruits, aka carambolas? Mine aren't really pretty enough for the market, however, they make an awesome wine. I'm also going to try a carambola & lemon marmalade. For the last several weeks these little stars have been dropping off the tree continuously. I've been picking them up and off the tree, slicing, freezing and filling my limited freezer space, the freezer at our office, my daughter's freezer, and still they're not done. Looks like two batches will be necessary. Six gallons each. Oh, my word (as they say in some parts) .... that's a lot of wine. Maybe I should get a license to sell it?? What do you think? Don't answer that question if you are a teetotaler. Like my husband. At the very least I'll finally publish my recipe. Though, not at this time, as I'm still tweaking it. The last two batches - '05 & '07 were a bit cloudy. Great taste, but I probably need to add more pectic enzyme and rack it a few more times.